Calvary supports a culture of open and transparent partnership with consumers and the community. The information provided on this site is to ensure that the communities Calvary serves have access to information about the quality of services provided. The following information provides data averaged across Calvary hospitals. Data from Calvary Mater Newcastle and Calvary Bethlehem are excluded as these services report through their state Departments of Health. Quality data from our public hospitals is published on the MyHospitals website. You can find information about Calvary aged care services by visiting Retirement Communities or calling 1800 222 000. In July 2014, Calvary undertook a comprehensive update of our clinical incident information systems to ensure that our data complied with the most current incident definitions and standards. This clinical indicator data is reported from our 2017-2018 incident management system. Calvary performs better than the industry benchmark for SAB infections. All Calvary hospitals have in place robust infection control procedures, including policies and procedures to manage, if necessary, outbreaks of diseases such as gastroenteritis or Ebola. While every effort is made to prevent healthcare associated infections, they sometimes occur as some patients (for example those receiving chemotherapy, patients undergoing surgical procedures and some patients with invasive devices) are more vulnerable to infection due to their health status. We have dedicated infection control staff in each of our hospitals, and they collect and analyse data to detect and prevent infections from occurring or spreading. Staphylococcus aureus (S. aureus) is a type of bacterium that can cause serious illness, especially if it infects the bloodstream of a patient. Staphyloccus normally lives on the skin. Some of these infections are acquired while receiving care from hospitals and other healthcare services. Hospitals aim to have as few cases of these healthcare-associated infections as possible. One of the most effective ways to prevent infections spreading in hospitals to ensure that everybody (including patients and visitors) wash their hands. We continually audit the practice of hand-washing in our hospitals to further reduce infections. After touching a patient’s belongings or surroundings. Calvary uses trained auditors to observe that healthcare workers do carry out the ‘five moments’. The Australian benchmark for correctly performing hand hygiene is 80%, an increase from 70% in 2017. All Calvary hospitals performed better than the benchmark. Calvary encourages all visitors to our hospitals to use antiseptic hand rub that is located at all entrances and throughout the hospital. Calvary performs better than the industry benchmark for this indicator. The risk of falling increases with age and patients in hospital are often at an increased risk of falling. Falls are a leading cause of hospital-acquired injury both in Australia and overseas. At Calvary, every patient fall is reported and investigated. All patients are assessed on admission for their risk of falling and if an increased risk is identified a specific management plan will be put in place for the patient. Calvary takes every effort to reduce injury from falls. This includes the use of specialized lifting equipment, the use of non-slip mats and socks and if necessary the use of bed and chair sensors that detect patient movement. Medication errors are one of the most common incidents in hospitals. Fortunately, most medication errors do not result in harm to the patient. Less than 1% of reported medication errors at Calvary result in harm to the patient. Medication errors include prescribing, dispensing, administration and documentation errors. Medication error may be more common in older patients due to the number of medications they may need to take. Calvary is in the process of implementing electronic medication management systems to reduce the preventable causes of medication errors. Accreditation of health services is a process through which services undergo external review against national and international standards in order to continuously improve quality of care. 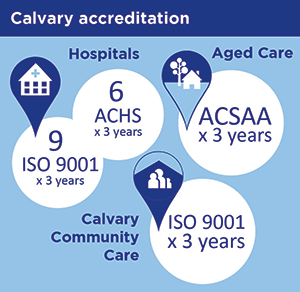 All Calvary Hospitals are accredited using the National Safety & Quality Health Service Standards developed by the Australian Commission on Safety & Quality in Health Care (ACSQHC). These standards were introduced in 2013 to provide consistent and independent assurance about the quality and safety of healthcare services across Australia. Calvary hospital services are accredited against either ISO 9001 or ACHS standards.